Spanish statesman, grammarian, poet, and Talmudist; born at Cordova 993; died at Granada 1055. His father, who was a native of Merida, gave him a thorough education. Samuel studied rabbinical literature under Enoch, Hebrew language and grammar under the father of Hebrew philology, Judah Ḥayyuj, and Arabic, Latin, and Berber under various non-Jewish masters. In 1013, in consequence of the civil war and the conquest of Cordova by the Berber chieftain Sulaiman, Samuel, like many other Jews, was compelled to emigrate. He settled in the port of Malaga, where he started a small business, at the same time devoting his leisure to Talmudic and literary studies. Samuel possessed great talent for Arabic calligraphy; and this caused a change in his fortunes. A confidential slave of the vizier Abu al-Ḳasim ibn al-'Arif often employed Samuel to write his letters. Some of these happened to fall into the hands of the vizier, who was so struck by their linguistic and calligraphic skill that he expressed a desire to make the acquaintance of the writer. Samuel was brought to the palace, and was forthwith engaged by the vizier as his private secretary. The former soon discovered in Samuel a highly gifted statesman, and allowed himself to be guided by his secretary's counsels in all the affairs of state. In 1027 the vizier fell ill, and on his death-bed confessed to King Ḥabus, who had expressed his sorrow at losing such an able statesman, that his successful undertakings had been mainly due to his Jewish secretary. Being free from all race prejudices, Ḥabus raised Samuel to the dignity of vizier, and entrusted him with the conduct of his diplomatic and military affairs. In his exalted position Samuel remained the same pious and modest scholar, and disarmed his enemies, who could not forgive him his Jewish faith, by his gentleness of manner and his liberality. The following is an illustration of his magnanimity: A fanatical Mohammedan dealer in spices, who lived near the calif's palace, once grossly offended Samuel while accompanying the calif. Incensed at the offense, the calif commanded Samuel to punish the fanatic by cutting out his tongue. Instead of executing this order Samuel made a present to the offender, and thus gained his gratitude. When the calif again noticed the seller of spices he was astonished at the change, and questioned Samuel about, it. "I have torn out," answered the vizier, "his angry tongue, and given him instead a kind one." The year 1037 proved to be the turning-point in Samuel's life. Ḥabus died, and there arose two parties in Granada who respectively rallied round two princes. The majority of the Berber nobles, and some influential Jews—Joseph ibn Migas, Isaac ben Leon, and Nehemiah Ashkofa—sided with the younger son of Ḥabus, while Samuel at the head of a smaller party supported the elder son Badis. The chances were all in favor of the majority, and Samuel ran the risk of losing not only his position, but also his life, when unexpectedly the younger son of Ḥabus abdicated in favor of his elder brother. Badis was then hailed king, and Samuel not onlyretained his former position, but became practically king of Granada, as the pleasure-seeking Badis paid but little attention to affairs of state. Samuel not only employed his power for the benefit of the Jews of Granada, of whom he was the authorized chief ("nagid"), exercising the functions of rabbi, but also strove, in his diplomatic relations, to ameliorate the condition of the Jews in other places. Greatly interested in the propagation of science, he spent enormous sums for copies of books, which he presented to poor students. He corresponded with the leading scholars of his time, especially with Hai Gaon and R. Nissim of Kairwan. Among the recipients of his bounty was Ibn Gabirol, who had been banished from Saragossa. "In Samuel's time," says Moses ibn Ezra in his "Kitab al-Muḥaḍarah" (comp. Munk, "Notice sur Abu'l Walid," p. 57), "the kingdom of science was raised from its lowliness, and the star of knowledge once more shone forth. God gave unto him a great mind which reached to the spheres and touched the heavens; so that he might love Knowledge and those that pursued her, and that he might glorify Religion and her followers." Samuel found recognition not only among his coreligionists, but also among the Mohammedans, many of whom were his stanch friends and admirers. An Arabic poet, Muntafil, extolled him in verse, and acknowledged that Samuel had made him a secret worshiper of the God who had prescribed the sanctification of the Sabbath. The best proof, however, of Samuel's great popularity is that, notwithstanding the machinations of the Mohammedan fanatics, he remained vizier until his death, and was succeeded in that office by his son Joseph. Of Samuel's writings only a few have been preserved. Besides two responsa, which have been inserted in the "Pe'er ha-Dor" (Amsterdam, 1765), only the "Mebo ha-Talmud" has been published (Constantinople, 1510; frequently reprinted together with the "Halikot 'Olam" of Joshua ha-Levi; and since 1754 together with the Talmud, at the end of the treatise Berakot). The work is divided into two parts: the first containing a list of the bearers of tradition from the members of the Great Assembly down to Enoch, Samuel's teacher; the second, a methodology of the Talmud. It was translated into Latin by Constantin l'Empereur, under the title "Clavis Talmudica, Completas Formulas, Loca Dialectica et Rhetorica Priscorum Judæorum" (Leyden, 1633). Another Talmudic work of Samuel's, entitled "Hilkata Gibbarwa," containing Talmudic decisions, is quoted by Me'iri in his commentary on Abot, by Bezaleel Ashkenazi ("Shiṭah Meḳubbeẓet," Ketubot 36b), and by others. 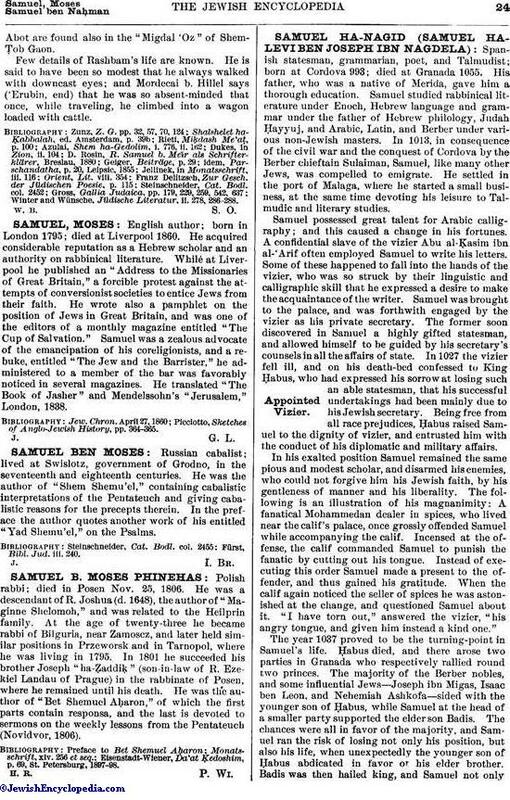 Of the poetical productions of Samuel there have been preserved a part of the "Ben Mishle," containing aphorisms and maxims, some of which have been published in various periodicals (see bibliography below), and fragments of a diwan, still extant in manuscript (Neubauer, "Cat. Bodl. Hebr. MSS." No. 2422, 18). 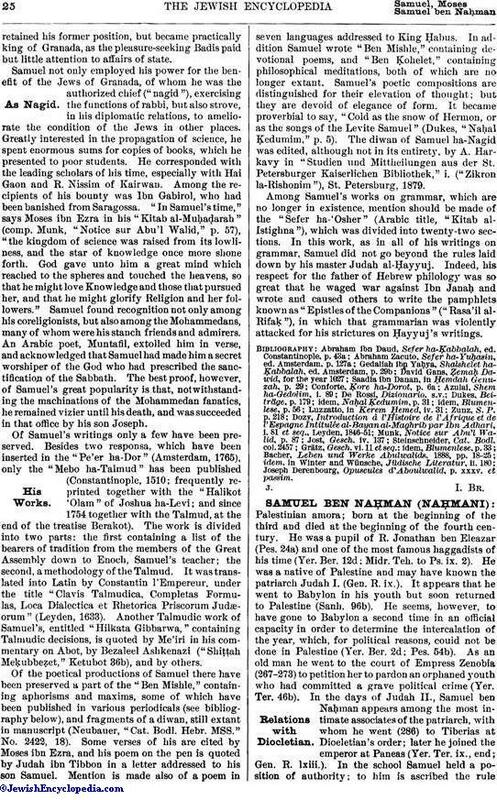 Some verses of his are cited by Moses ibn Ezra, and his poem on the pen is quoted by Judah ibn Tibbon in a letter addressed to his son Samuel. Mention is made also of a poem in seven languages addressed to King Ḥabus. In addition Samuel wrote "Ben Mishle," containing devotional poems, and "Ben Ḳohelet," containing philosophical meditations, both of which are no longer extant. Samuel's poetic compositions are distinguished for their elevation of thought; but they are devoid of elegance of form. It became proverbial to say, "Cold as the snow of Hermon, or as the songs of the Levite Samuel" (Dukes, "Naḥal Ḳedumim," p. 5). The diwan of Samuel ha-Nagid was edited, although not in its entirety, by A. Harkavy in "Studien und Mittheilungen aus der St. Petersburger Kaiserlichen Bibliothek," i. ("Zikron la-Rishonim"), St. Petersburg., 1879. Among Samuel's works on grammar, which are no longer in existence, mention should be made of the "Sefer ha-'Osher" (Arabic title, "Kitab al-Istighna"), which was divided into twenty-two sections. In this work, as in all of his writings on grammar, Samuel did not go beyond the rules laid down by his master Judah al-Ḥayyuj. Indeed, his respect for the father of Hebrew philology was so great that he waged war against Ibn Janaḥ and wrote and caused others to write the pamphlets known as "Epistles of the Companions" ("Rasa'il al-Rifaḳ"), in which that grammarian was violently attacked for his strictures on Ḥayyuj's writings. Joseph Derenbourg, Opuscules d'Aboulwalid, p. xxxv. et passim.